Find Better Ideas, Faster ® with a custom sleep mask trend report, our PRO Dashboard and 80+ categories of premium trend reports. Within the Sleep Mask Trend Report, readers will be able to explore the newest products being offered to consumers. This report will delve into the realm of materials, tech-embedded masks and designs that are helping consumers improve their sleep and beauty rituals. 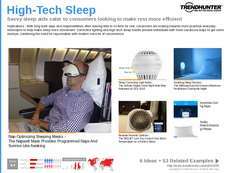 There are advancements being made to sleep masks that are allowing them to do more than simply block out light. In order to understand how the industry is changing, Trend Hunter uses crowdsourced research to gain valuable consumer insights. Those who work in the healthcare and beauty industry will be able to take advantage of this report’s information. There is a compilation of trends that determine how consumers are using sleep masks and what the specific benefits are. Designers and retail store operators can also use this report to cater to their consumers in a more exclusive manner. The Sleep Mask Trend Report will inform you of the current trends and rituals, which will allow you to create the best products for your consumers. Consumers are looking to track more and more activities, even their rest.